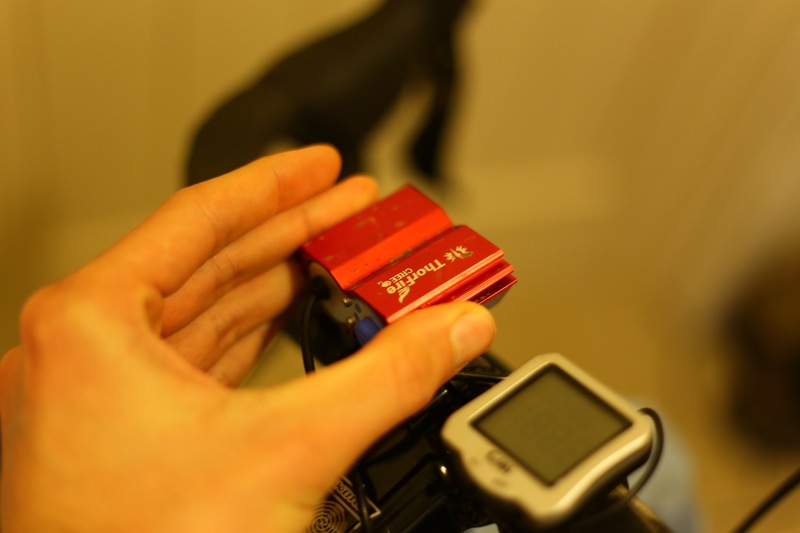 Cheap bike lights direct from China – Are they any good? This is an initial review after a few muddy and wet night MTB and road rides. There is a growing trend for people to buy products like LED bike lights direct from China, the prices look amazingly good and delivery is quicker than it used to be, but it’s always a gamble as to the quality control on each individual product and whether the bike lights will actually turn up, so hopefully this gives an honest and useful review for you. I bought two front U2 CREED style light units and three battery packs to test for consistency and quality and to see if they stand up to the the claims made. 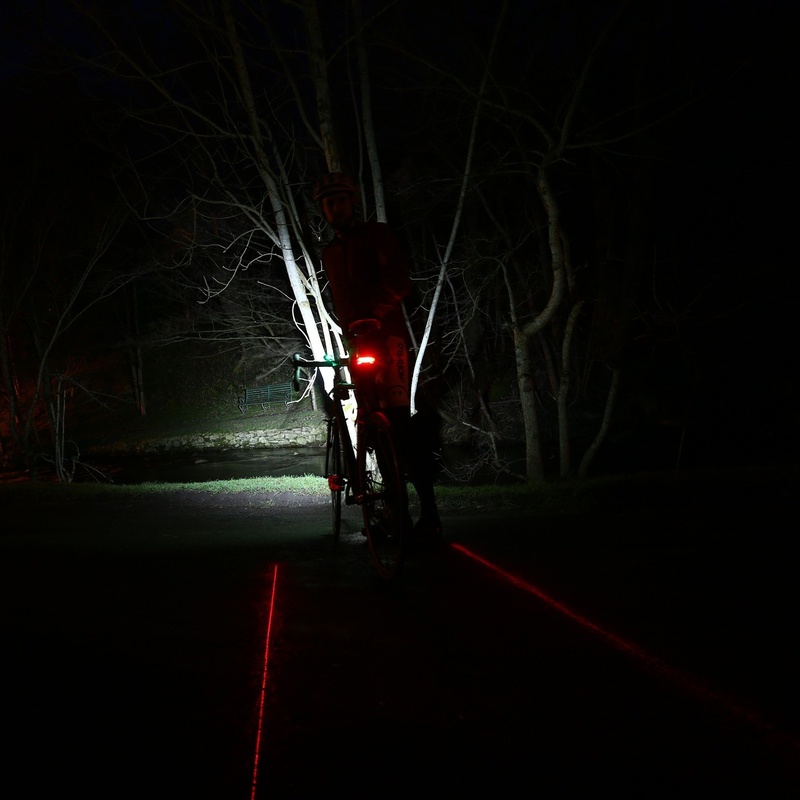 I also bought two rear lights with added laser beams that mark out a red line on the road as a private cycle lane like a few much more expensive places sell. I bought the lights from the massive Banggood website, they sell everything you could ever imagine at dirt cheap prices, most stuff is pure plastic junk but there a few decent(ish) quality bargains. However if you click on the Ali Express link below you can search for loads of Chinese suppliers selling these or similar lights using the hopefully protected checkout from Ali Express, delivery will be a bit slower but prices tend to be the very lowest about. 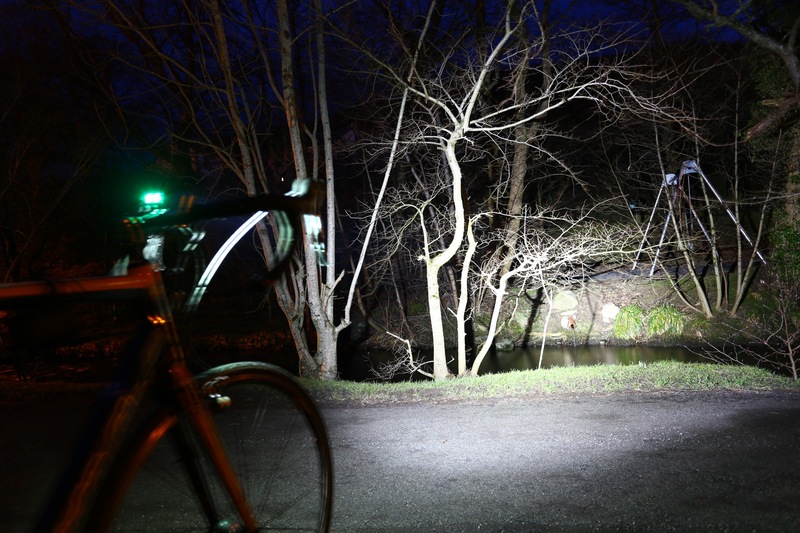 1 x 2*CREE XM-L U2 Led Light – Rated at 5000 lumens but I suspect closer to 1500 if that! 1 x Battery Pack(4.2V) 4200mah or some lucky people randomly get the 6400mah! They cost me an unbelievably cheap: £13.40 with battery or £10 without. including free delivery to the UK either from their UK/USA warehouse or direct from China. Delivery can be in a week but it’s safe to assume it will take around two weeks like on all the orders from Banggood China that I have placed. There is no customs duty to pay as they are too low value. If you order more than one they will normally come in separate packs and avoid customs duty. The light was originally rated at 5000 lumens but that is very ambitious and was possibly removed from the website description a bit later I think. On full power with a fresh battery I think they’re the same as a below average car headlight on low beam. To back this up I found when riding in front of a car no real shadow is cast by me because these bike lights are similar to the car headlight. 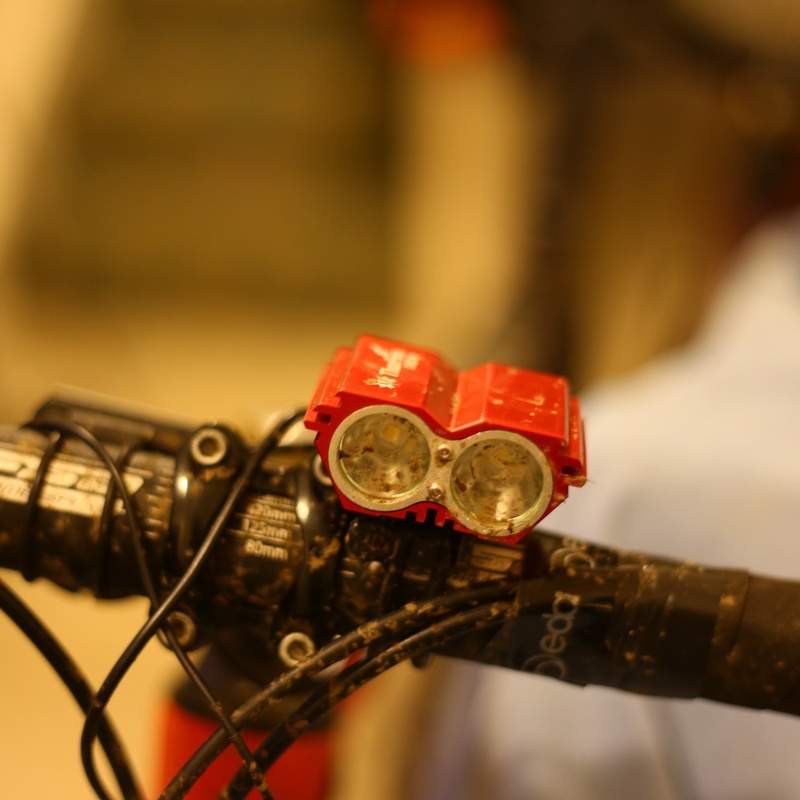 I would guess output is at around 1000 lumens on full and fuly charged, because they have plenty of light for off road mountain biking and also a bit wider and further penetrating than previous bike lights I have used at the 500 to 700 lumen rating. The beam is slightly on the flood side of things rather than total spot, it is actually a good width, not too wide that it wastes light but not too spot that there is no peripheral version. I would personally still use one on the bar and one on the helmet but they’re so bright that using one on the bars did prove adequate for on and off road when testing. I think the picture above on full shows the light well. The picture below shows just how tiny and lightweight the light unit is, you really don’t notice this on your helmet at all. The website states you will randomly get either a 4200mah or 6400mah battery. I received 3 * 4200mah ones and these lasted an hour on full power before it drastically faded over the next 30mins, but for about 1.5hrs it was usable for off road single-track riding but only really for the first hour if on full constantly. Riding on road I was regularly swapping between full and low depending on the road and it lasted for just under 2.5 hours before fading quickly to a very dull beam that could only be used to limp home. Since then the run time has been about consistent with the brand new performance. But unlike decent branded lights they declined constantly until flat rather than maintain a steady output. The flash mode is comparable to the low mode for battery consumption as it seems to flash in full beam, helpfully warning and annoying all car drivers for miles around! In fact the flash is so bright it lights up reflective signs 100’s of metres away! I assume the higher power 6400mah battery would add another bit onto these run times, but that’s a guess. 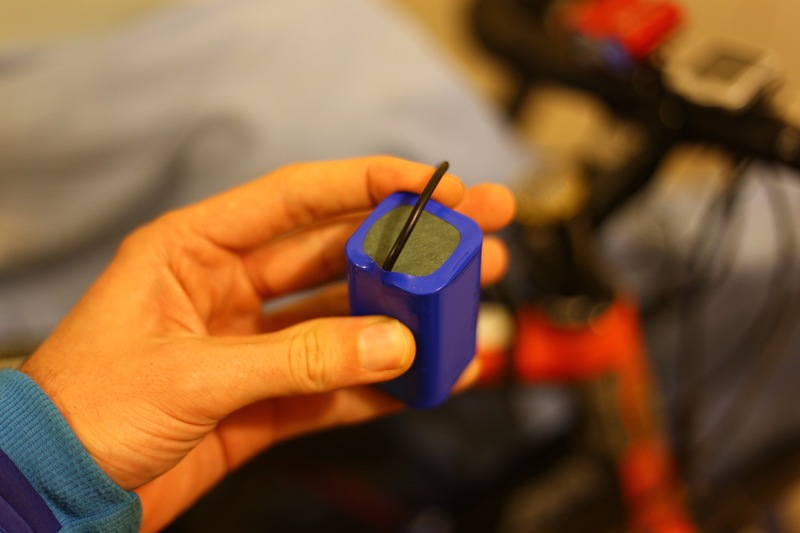 At only £6 I would bung a spare battery on the order and put it in my pocket each ride! There are reports of cheap batteries exploding or leaking slightly but these particular batteries seem a step up from those bodged units, saying that I would never leave them on while out for the day. Charging takes about 4 hours using the standard charger that usefully goes from red to green when full. Also if you order a spare battery it comes with another useful back up charger plus UK adapter. I had very low expectations but the LED light unit is actually really well made from solid Aluminium and it seems well weather sealed to look at (see update below). The bar attachment works OK but it is just a tough rubber ring that stretches around so it will slip a bit without something grippy on the bars. A bit of cunning DIY taping and it is easy and simple to keep it in place though. On the helmet the light sits really snuggly and I had no issues with using the supplied band. The battery is wrapped in plastic but not waterproof at the ends, so some gaffer tape and a plastic bag is needed for wet rides, although I used it as it was without issue for these first few rides. The holster is actually a simple but effective bag that Velcro fastens securely onto the frame or the wire reaches long enough to stash into a backpack from the helmet. I had one velcro strap snap off. The wire joint is a push fit with a screw ring to secure and weatherproof it. This is much better quality than I had expected and does a great job. I ordered two light units because often with cheap items like this you get a duff one, but all I can say is the two I have received and used worked perfectly straight out of the box. and £6 for a spare battery. That’s a heck of a lot of light power for 32 quid, costing not much more than a decent rear LED light from a big brand!! It’s night riding season again so out came these lights again. On first use one light unit had failed, maybe from being stored damp over the summer. I bought another T6 LED unit that uses the same Aluminium housing as the U2 LED one tested. It performs the same in terms of brightness and run duration and is the same price. But it is far more of a spot and whiter light than the U2 LEDs, good for on the helmet. To my surprise the batteries all seem good still with decent run times, it’s just one light unit that seems to now not work after the summer….. a few rides into winter and it was absolutely chucking it down on a night ride. The next day another light unit had stopped working. Hmmm maybe the weather seals are not as good as I thought. I had bought a replacement as I think it was probably my fault for storing the one damp over summer and the new one is fine, but this was the T6 LED rather than the U2 that’s wider and warmer light beam. I think this shows longevity and sealing isn’t as good as a £100+ equivalent, but I guess we probably knew this. In total I now have 6 battery packs to cover 24hr racing and all but one is performing well it is just the light units and prolonged wet Scottish riding that seems to be the issue. 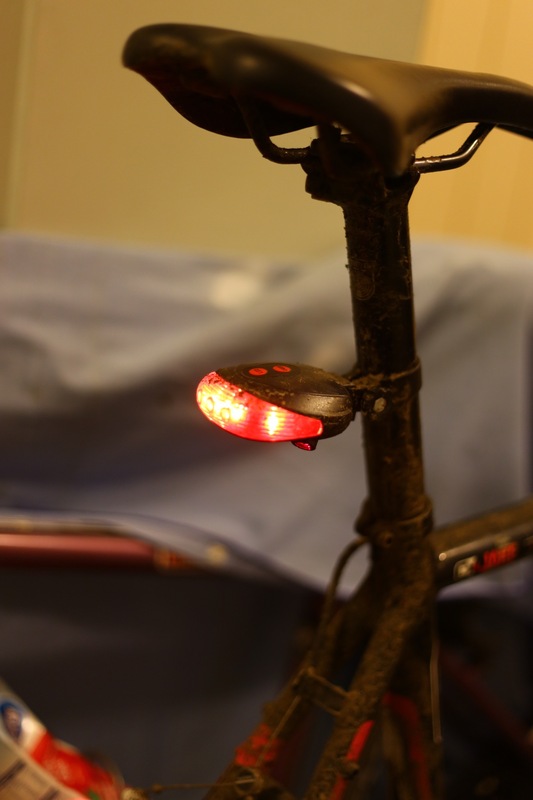 I ride a lot over winter and I’m getting bit annoyed with cheap lights. Do I buy another light unit to use with the batteries or call it quits….The best branded lights I reviewed a selection here, as I have been using Exposure and Hope lights and love them. They really are worth the money in the long run if you have the cash. At the same time I splashed out on a rear LED light with a difference: It has added Laser beams!!! Basically it has a normal 5 LED red rear light that uses 2xAAA batteries. Then on either side it has a laser beam that draws a red line either side of your bike on the road, therefore creating a personal bike lane. It’s super cool, it might look a bit weird for drivers but it certainly seemed to slow drivers down!! Click here for more info at £3.72 including free delivery!!!! The LEDs are pretty bright and effective I estimate at around 0.5 watts and last long enough that after 5 hours use they are still going strong and as bright as when I started. The website claims up to 36 hours which sounds about right and is pretty standard for a blinking rear LED. The fitting onto the seat post is a standard design but the screw to tighten is only hand tightened so can loosen a bit and droop down, so worth keeping an eye on or you can just replace it with a small bolt. 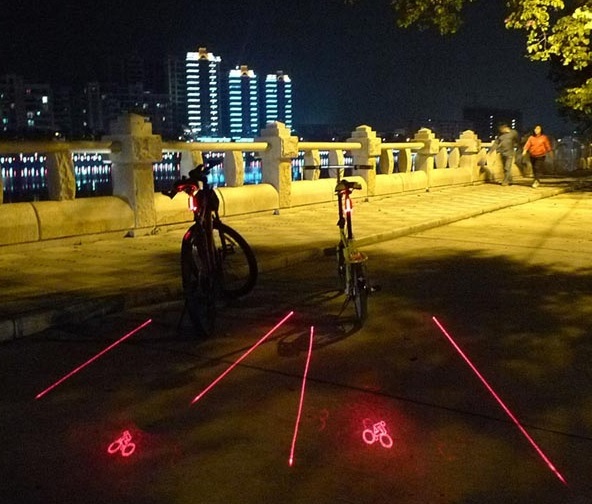 These are two small lasers that shoot out both sides and leave a 1m long red line on the road as you cycle along. They are easily bright enough to be clearly seen in the dark but they do understandably fade a bit under bright street lighting. In the pure dark however they are really clear and effective. The main negative is that any water or dirt that regularly splashes onto the laser exit port ans does easily dull the or totally block the laser so mud guards or regular cleaning are needed. I assume the lasers will reduce the battery life but I have used them intermittently for 5 hours and they show no signs of fading. The website claims 9 hours as the shortest run time on two AAA batteries and I imagine that is about right with the LED and Laser on constantly. The laser can be seen in picture below just under the LEDs. Note : Do not look directly at the laser lights! Build quality might be a bit questionable because the plastic feels very brittle and cheap and a bit shoddy but they work fine and so far have lasted. If you are careful with the plastic fittings then at £3.72 you can’t go far wrong and more than being a novelty I think they might just slow down more drivers! The lights have not fared too well long term, surprise surprise I hear you say. I don’t use mudguards and they got sprayed with water, a lot, put simply they’re not waterproof and they did rust inside quickly after heavy rain damp (who drys out their rear lights though?). Yes they certainly aren’t really up to the water blasting them! They are good if you commute in the dry or if fitted out of the way of spray but a bit of a waste of time for daily all weather commuters. I won’t get another set, lets put it that way. I spent a tenner on some 1watt Smart brand rear lights and the difference in quality is huge! Lesson learnt! Interesting, I’ve never had a battery pack go wrong in two winter’s use. It was the light units that have failed on me like I have updated. 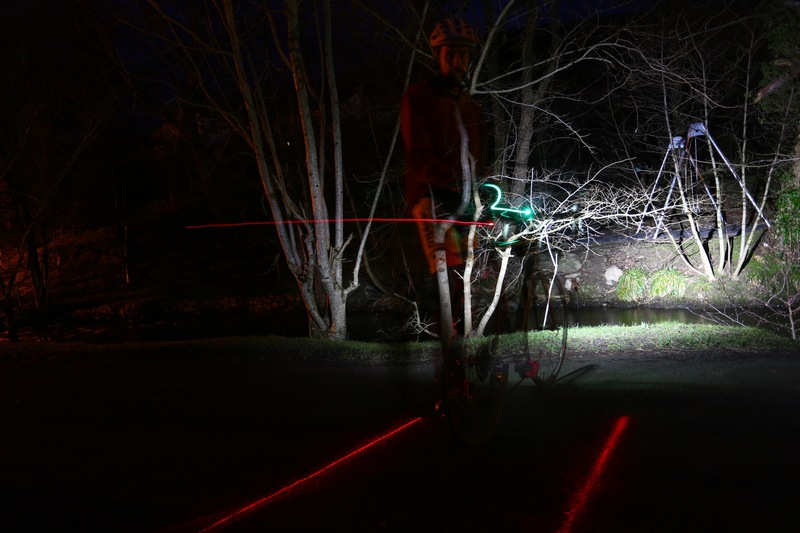 I have been using branded lights this winter so far as a new test.